Choirs from St. Scholastica will ring in the season with favorite Christmas songs during two concerts benefitting CHUM on Dec. 14 and 15, at The Cathedral of Our Lady of the Rosary in Duluth. 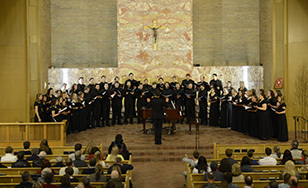 The St. Scholastica Concert Choir, Bella Voce, Vox Anima and Cantus Corde will unite for this annual celebration of the Christmas season through song. Concerts will be at 7:30 p.m. on Friday, Dec. 14 and Saturday, Dec. 15 at 2801 East 4th St., Duluth. The program will include pieces from sacred and secular Christmas music to welcome listeners into the Christmas spirit. The concert typically sells out, so buying tickets early is advised. This concert is a collaboration with CHUM. In addition to the cost for admission, donations will be accepted during the concert. Funds raised will benefit the Steve O'Neil Apartments. Tickets are $10 and are available through the Spotlight Box Office at (218) 723-7000, spotlight.css.edu or spotlight@css.edu.